Identity/Class: Human, either mutated or magically altered. 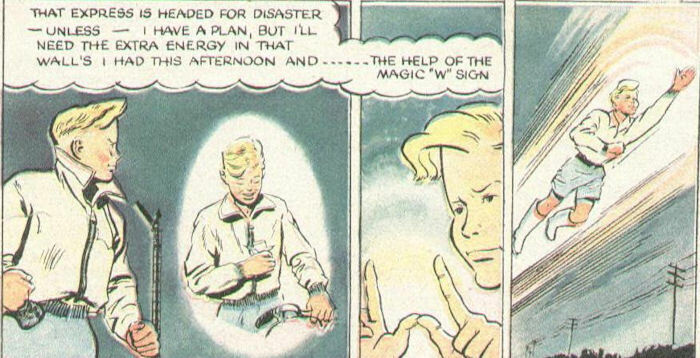 Powers/Abilities: Tommy can activate superhuman strength and speed by making a W sign with his hands. He can also fly. 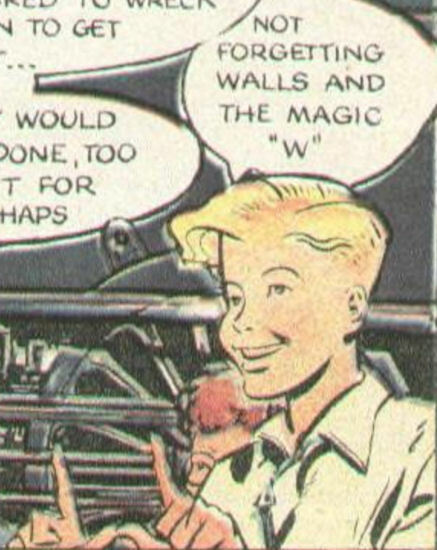 History: Empowered with "extra energy" from eating Wall's Ice Cream, Tommy Walls can access magical abilities by making a magical W sign with his thumbs and forefingers, allowing him to fight crime and intervene when disaster threatens. Comments: This comic strip was sponsored by Walls' Ice Cream. 'Tommy Walls' was originally drawn by Frank Hampson, who drew the first six stand alone episodes. 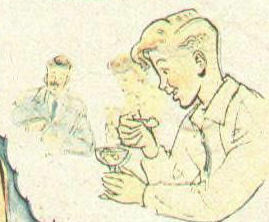 Other artists who worked on the strip included Harold Johns and John Worsley, before Richard Jennings became the regular artist and the one- off stories became continuing ones. Jennings also wrote most of the stories he drew. In the first 'Eagle' Tommy was able to perform superhuman feats thanks to Walls Ice Cream, but the impossible feats were soon dropped in favour of natural abilities. His love of Walls Ice Cream was not dropped of course as the company sponsored the strip and it was mandatory that at least one of the heroes had to stop off for an ice cream each week! Tommy had two friends called Bobby and Lennie and they often assisted the head of Britain's secret service 'Sir Gerald' to fight the nations' enemies. Thanks to Stephen Winders for the above informative paragraph.